(Motormouth & Killpower#8 (fb) - BTS) - When the Warheads first recovered the protosilicon geoid which ultimately created the computer warrior Digitek, the Nakasoni Corporation issued slivers of the substance, which at the time they saw merely as living silicon and nothing more, to the Gena-Sys Corporation. Doctor Oonagh Mullarkey, whose own researches led to the creation of Killpower, used the material in two ways. Identifying the protosilicon's learning abilities as of prime importance to her work, she first built some of the material into the Genetix body armor, enabling it to upgrade defenses not only with further programming but also through combat experience. More bizarre, however, was her highly experimental micro-surgery work on an amoeboid life form also recovered by the Warheads, which appeared to adapt its form in response to external stimuli. Splicing the protosilicon and the alien DNA into several completely new hybrid creatures, Mullarkey produced a small number of gestalt life forms. These where further adapted by magical means by Mys-Tech board member Wychwood. The experiment proved interesting, but not so interesting that Mullarkey and Wychwood thought it worth pursuing. The creatures, although apparently intelligent, seemed dangerously unstable and their destruction was ordered. This was a task to be carried out under Porlock's direction, as part of a weapons testing exercise by Strike Force Q7, a specialist hit squad. After several attempts however, it became clear that the life-forms were adapting to life-threatening situations by literally re-evolving when under threat of death, improving their ability to survive under hostile conditions! It was these creatures that became the Harpies, creatures which save themselves from destruction by absorbing various energies and drawing on the programs installed in the protosilicon to access a library of different body shapes and adapt them to their own needs. If one particular form proves unsuitable for survival, the Harpies can re-form, upgrading their defenses and changing their appearance to suit a new situation. the body shape programs are only the basis for any new form. Within the gestalt the five surviving creatures developed limited separate personalities, which is why they do not look identical. Porlock immediately saw their potential as reusable assassins and set about sending them on suicide missions, giving the Harpies plenty of opportunity to improve their abilities. (Motormouth & Killpower#8) - After Cable and Badhand liberated the Clavis Key from Mys-Tech, the Harpies appeared before Porlock and Crowe. They were sent after Cable and Badhand to find out what they were up to, as the board where unaware how important the Key was. They boarded a craft and began chase. Having nearly caught up, they opened fire. Cable stopped his craft dead letting the Harpies continue on ahead of them, and giving him a chance to activate his cloaking screens. However, Cables technology was primitive by the standards of the Mys-Tech craft the Harpies were using. The Harpies crafts sensors showed that Cable ship was cloaked, and so they activated their own screens and followed at a discrete distance. (Motormouth & Killpower#8 - BTS) - As Cable and Badhand arrived at the Parton Magna stone circle in Sussex, the Harpies relayed their entire conversation directly to Crowe. 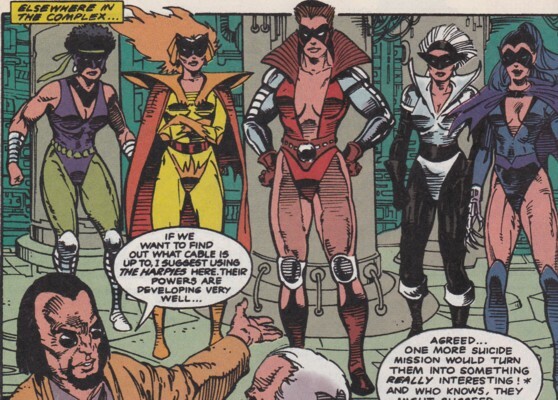 (Motormouth & Killpower#8) - Finally realizing the importance of the Key, Crowe ordered the Harpies to get it back. Rook acknowledged the order, and had Firecrest close communications. She reminded her sisters that their first loyalty was to Porlock, not Crowe, and that anything they learned should be passed on to him. Then they activated their craft's tractors and stasis ray in order to retrieve the Key. Paralyzed, Cable began levitating toward the Harpies craft with the Key in hand. Badhand was paralyzed too, rendering him unable to help at first. (Motormouth & Killpower#9) - With great effort, Badhand resisted the effects of the stasis ray and moved his cybernetic arm. He fired a blast at the Harpies craft, releasing Cable and the Key, and causing the Harpies ship to crash. As Cable and Badhand left, having placed the Key in the center of the stone circle, Rook climbed out of the wreckage of the Harpies craft. Although the Key was vanishing, returning to is rightful owners, it interfered with her communications device and she was unable to contact Porlock. Badly wounded, Firecrest insisted they change their form in order to survive. Rook objected as her body as undamaged, but the rest of her sisters were. Ultimately, she either didn't or couldn't resist as the gestalt began their transformation. Firecrest announced that the stone circle would be a good place to change and that their powers would be much magnified; the transformation began as her hand joined with Rook's. (John Freemans unpublished harpies profile) - The Harpies were exposed to a unique combination of chronal and majickal energies. Their appearance changed dramatically from the human forms they had adopted, and this new power source enabled them to exist across several seconds of time. The Harpies no longer existed at one point in time, and consequently became even more difficult to kill, enabling them to attack a foe with frightening surprise and ferocity. The aliens honed their powers to be able to concentrate tooth and claw on the present, ripping into a hapless victim with ease but often appearing like ghostly attackers. Of all the Harpies, Rook resented this most recent change the most, seeking to return to her human form. However, without the agreement of her sisters in the gestalt, this was impossible. (Shadow Riders#2 (fb) - BTS) - Somehow the five Harpies became six, and the group was renamed Slaughterhouse Six. According to Porlock they preferred this new team name. (John Freeman's unpublished harpies profile) - Porlock decided to pit the gestalt, now near-indestructible assassins, against the Shadow Riders as the first major field test of their powers. 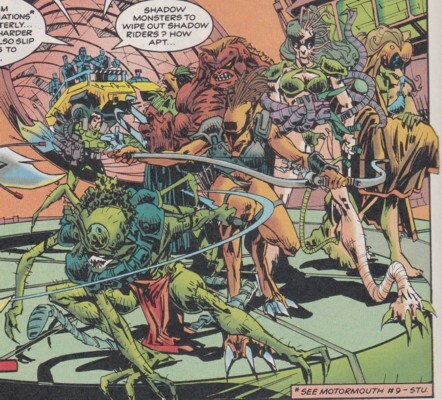 (Shadow Riders#2) - Somewhere in the huge complex that is Mys-Tech's London headquarters, the group appeared to be undergoing some sort of training exercise as Porlock showed them to the rest of the board. They fought a group of Mys-Techs guards, killing some if not all of them. (Shadow Riders#3 (fb) - BTS) - Porlock took Slaughterhouse Six to Arena World and asked Rathcoole to send some Warheads to test their abilities as a "warm up" before the arrival of the Shadow Riders. (Shadow Riders#3) - Slaughterhouse Six attacked the Warheads troop almost as soon as they arrived on Arena World. Porlock ordered them to stop before the could kill all of the Warheads, however. Later, the Shadow Rider's arrived with Cable and Mathew Ryan in tow. Slaughterhouse Six attacked. During the conflict, Porlock triggered a transformation in Mathew Ryan, unleashing his Abadon persona. Abadon stunned Cable and the Shadow Riders with his powers, putting an end to the fighting temporarily. (Shadow Riders#4) - The Shadow Riders and Cable gained some respite when their ally Goodfellow appeared and confronted Abadon. Porlock ordered Slaughterhouse Six to attack, but Goodfellow power leeched one of them and transferred their time-phase power to Boot. Boot used this ability to slip himself and his companions between dimensions to safety, and Cable pulled the warhead called Che with them. Porlock ordered Slaughterhouse Six and the remaining Warheads to return to Earth. They returned to the portal station in Annapurna, India, that they had used to reach Arena World. Comments: Created by Graham Marks, John Freeman, Del Barras, Pat Prentice, and Sophie Heath. I had good fun reading these old issues, but there was a lot to figure out with these characters. Fortunately the notes of John Freeman came in extremely handy, especially as he had a profile detailing their abilities. 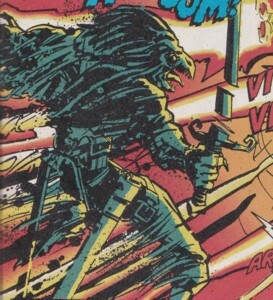 There was a mini profile in Motormouth#8 with their origin and original abilities, and the one John provided fleshed that out with more on the abilities of their newer forms in Shadow Riders. It appears to be in the format of the profiles that appeared from time to time in Overkill magazine and was quite likely intended for publication in there. It stated that the Harpies could call on psychic powers and were incredibly strong and fast, but didn't say if this applied to them prior to Magna Parton. I have assumed that it does, but that their adapted forms were superior in those respects. They aren't shown lifting any great weights, so I've put some low estimates in italics in the sub profiles. Only three of the five Harpies are named in the pages of Motormouth and Killpower. That left two left for me to name. But wait! In Shadow Riders there are six Harpies! There is no explanation as to where number six came from, though my guess would be that as formerly amoeboid beings they can replicate asexually and one of them did so at Magna Parton when they absorbed the energies there and altered their forms. Rook wasn't badly damaged, maybe she had energy to spare and was able to birth a new team member. No other names for the individual members crop up in Shadow Riders, and none of the previous names are reused so I had to figure out which character was which as best as I could. See the sub profiles below for my reasoning. I could well be wrong, but felt it was easier to make a best guess for the sake of the sub profiles. I'll happily have the profile edited if any evidence comes to light that can pinpoint who's who. When Goodfellow leeches one of the Harpies time phasing powers and transfers it to Boot it is used to place the Shadow Riders and their friends in a time bubble, out of synch and out of sight of the enemy. The Harpies aren't shown to be able to do this, but it may that they already can and we just didn't see it or that it's a potential area of their ability they haven't developed yet. It occurs to me that with their ability to evolve that these are a group of antagonists who could be brought back again and again and updated by various creative teams. Would updating this profile with fresh images become tricky? Possibly, but I'm not expecting a massive come back anytime soon for these not so lovely ladies. Massive thanks to John Freeman for providing some extremely detailed information on the Shadow Riders series, especially the Harpies profile I mentioned above. John is a writer and editor who did a lot of work for Marvel UK and Doctor Who Magazine, and has a site called Down The Tubes. Its features news and interviews on British comics and has a comic writing guide. Also, a big thanks to Markus�Raymond for dutifully scanning images for this profile. This Harpy appears to be a new member of the gestalt that appeared after their transformation in the Parton Magna stone circle. Porlock decided to pit Slaughterhouse Six against the Shadow Riders as the first major field test of their powers. At Mys-Tech's London headquarters, the group appeared to be undergoing some sort of training exercise as Porlock showed them to the rest of the board. The group were pitted against Mys-Tech guards. Then Porlock took Slaughterhouse Six to Arena World and asked Rathcoole to send some Warheads to test their abilities as a "warm up" before the arrival of the Shadow Riders. Slaughterhouse Six attacked the Warheads troop almost as soon as they arrived on Arena World. Porlock ordered them to stop before they could kill all of them, however. Later, the Shadow Rider's arrived with Cable and Mathew Ryan in tow. Slaughterhouse Six attacked. When the Shadow Rider called Stranger realized the nature of Slaughterhouse Six's phasing powers, he Cable and Boot recalibrated their energy weapons to phase over the widest possible electromanetic scale. The three blasted this particular Harpy, causing her to scream in pain. During the conflict, Porlock triggered a transformation in Mathew Ryan, unleashing his Abadon persona. Abadon stunned Cable and the Shadow Riders with his powers putting an end to the fighting temporarily. The Shadow Riders and Cable gained some respite when their ally Goodfellow appeared and confronted Abadon. Porlock ordered Slaughterhouse Six to attack, but Goodfellow power leeched one of them and transferred their time-phase power to Boot. Boot used this ability to slip himself and his companions between dimensions to safety, and Cable pulled the warhead called Che with them. Porlock ordered Slaughterhouse Six and the remaining Warheads to return to Earth. They returned to the portal station in Annapurna, India, that they had used to reach Arena World. Abilities: She carried a sword. Like all of the Harpies in their Slaughterhouse Six forms, she can slip between dimensions to avoid danger. She can fly at extreme speeds (subsonic) and is hard to kill. As part of the Harpy gestalt, she can adapt to life threatening situations by re-evolving when under threat of death. This improves their ability to survive under hostile conditions. To this end they can absorb various energies and draw on the programs installed in the protosilicon to access a library of different body shapes and adapt them to their needs. If one particular form proves unsuitable for survival, the Harpies re-form, upgrading their defenses and changing their appearance to suit a new situation. The Harpies can also call upon powerful psychic energies and are incredibly strong (lifting perhaps 1 ton) and fast. Each maintains a strong psychic link with the other, which often means that the pain of one will affect the performance of the rest of the group. During their transformation at the Magna Parton stone circle, the Harpies absorbed a unique combination of chronal and majickal energies. This new power source enables them to exist across several seconds of time. They do not exist at one point in time and are consequently difficult to kill, enabling them to attack a foe with frightening surprise and ferocity. They have honed their powers to be able to concentrate tooth and claw on the present, ripping into a hapless victim with ease but often appearing like ghostly attackers. Note: She appears to have a large beak, and as I needed a bird themed codename for her it seemed like an obvious choice. Firecrest and her sisters were sent after Cable and Badhand by Porlock and Crowe. Firecrest operated a section of the control at one point, and was ordered by Rook to close communications so they could speak without Crowe overhearing. She also operated the tractors and stasis ray in an attempt to retrieve the Clavis Key. When the craft was shot down by Badhand, Firecrest was badly damaged. She pulled herself out of the wreckage to find Rook unharmed, but with the remaining Harpies damaged she told Rook not to resist the call to change their forms. I believe Firecrest transformed into an orange skinned form as shown below. Although she wasn't identified as Firecrest in Shadow Riders, I'm judging by the similar orange theme of both forms. Porlock decided to pit Slaughterhouse Six against the Shadow Riders as the first major field test of their powers. At Mys-Tech's London headquarters, the group appeared to be undergoing some sort of training exercise as Porlock showed them to the rest of the board. The group were pitted against Mys-Tech guards. Then Porlock took Slaughterhouse Six to Arena World and asked Rathcoole to send some Warheads to test their abilities as a "warm up" before the arrival of the Shadow Riders. Slaughterhouse Six attacked the Warheads troop almost as soon as they arrived on Arena World. Porlock ordered them to stop before they could kill all of them, however. Later, the Shadow Rider's arrived with Cable and Mathew Ryan in tow. 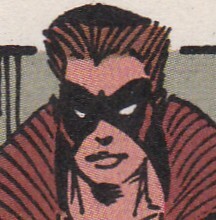 When Slaughterhouse Six attacked, Firecrest came into conflict with Ryan who beat her back with his psi powers. However, Porlock triggered a transformation in Mathew Ryan, unleashing his Abadon persona. Abadon stunned Cable and the Shadow Riders with his powers putting an end to the fighting temporarily. The Shadow Riders and Cable gained some respite when their ally Goodfellow appeared and confronted Abadon. Porlock ordered Slaughterhouse Six to attack, and Firecrest fired an arrow at Grunt. However, Goodfellow power leeched one of her sisters and transferred their time-phase power to Boot. Boot used this ability to slip himself and his companions between dimensions to safety, and Cable pulled the warhead called Che with them. Porlock ordered Slaughterhouse Six and the remaining Warheads to return to Earth. They returned to the portal station in Annapurna, India, that they had used to reach Arena World. Abilities: Firecrest appeared to be able to pilot the Harpies craft, taking over from Rook at one point. Her head and hair have the appearance of being on fire. She started out as an amoeboid life form. As part of the Harpy gestalt, she can adapt to life threatening situations by re-evolving when under threat of death. This improves their ability to survive under hostile conditions. To this end they can absorb various energies and draw on the programs installed in the protosilicon to access a library of different body shapes and adapt them to their needs. If one particular form proves unsuitable for survival, the Harpies re-form, upgrading their defenses and changing their appearance to suit a new situation. The Harpies can also call upon powerful psychic energies and are incredibly strong (lifting around 800 lbs increasing to 1 ton after Magna Parton) and fast. Each maintains a strong psychic link with the other, which often means that the pain of one will affect the performance of the rest of the group. In her new form she had claws on her feet. She used a bow. Like all of the Harpies in their Slaughterhouse Six forms, she is even harder to kill. Furthermore, she can slip between dimensions to avoid danger. This new form is extremely fast, and may be able to fly (at subsonic speeds) like her sisters. Hatch and her sisters were sent after Cable and Badhand by Porlock and Crowe. When Cable activated his transports cloaking screen, Rook detected it and reported it to Hatch. Hatch told her to activate their own screen and follow discretely, which Rook did. The ship was later shot down, forcing Hatch and her sisters to alter their forms in order to survive. I believe Hatch then transformed into a form with tentacles as shown below. Although she wasn't identified as Hatch in Shadow Riders, I'm judging by the similarity of their masks. Porlock decided to pit Slaughterhouse Six against the Shadow Riders as the first major field test of their powers. At Mys-Tech's London headquarters, the group appeared to be undergoing some sort of training exercise as Porlock showed them to the rest of the board. The group were pitted against Mys-Tech guards. Then Porlock took Slaughterhouse Six to Arena World and asked Rathcoole to send some Warheads to test their abilities as a "warm up" before the arrival of the Shadow Riders. Slaughterhouse Six attacked the Warheads troop almost as soon as they arrived on Arena World. Hatch attacked Che from behind, restraining him and putting a knife to his throat. However, Porlock ordered them to stop. Later, the Shadow Rider's arrived with Cable and Mathew Ryan in tow. Slaughterhouse Six attacked. During the conflict, Porlock triggered a transformation in Mathew Ryan, unleashing his Abadon persona. Abadon stunned Cable and the Shadow Riders with his powers putting an end to the fighting temporarily. The Shadow Riders and Cable gained some respite when their ally Goodfellow appeared and confronted Abadon. Porlock ordered Slaughterhouse Six to attack, but Goodfellow power leeched one of them and transferred their time-phase power to Boot. Boot used this ability to slip himself and his companions between dimensions to safety, and Cable pulled the warhead called Che with them. Porlock ordered Slaughterhouse Six and the remaining Warheads to return to Earth. They returned to the portal station in Annapurna, India, that they had used to reach Arena World. Abilities: She started out as an amoeboid life form. As part of the Harpy gestalt, she can adapt to life threatening situations by re-evolving when under threat of death. This improves their ability to survive under hostile conditions. To this end they can absorb various energies and draw on the programs installed in the protosilicon to access a library of different body shapes and adapt them to their needs. If one particular form proves unsuitable for survival, the Harpies re-form, upgrading their defenses and changing their appearance to suit a new situation. The Harpies can also call upon powerful psychic energies and are incredibly strong (lifting around 800lbs increasing to 1 ton after Magna Parton) and fast (more so since Magna Parton). Each maintains a strong psychic link with the other, which often means that the pain of one will affect the performance of the rest of the group. In this new form her hair appeared grey to begin with but green later on. One side of her face has short tentacles, which may have been functional. Her right arm splits into three clawed tentacles. Her left leg was elongated and tentacle-like with claws at the end. She also had larger tentacles protruding from her back and a prehensile tail. She wielded a knife. Like all of the Harpies in their Slaughterhouse Six forms, she is even harder to kill. Furthermore, she can slip between dimensions to avoid danger. She can fly at extreme speeds (subsonic). 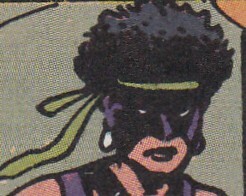 This character remained unnamed throughout all her appearances. As Firecrest and Rook are bird names, and Hatch is something a bird egg might do, I went for other bird related names for the unidentified Harpies. I went with Kite, after the Red Kite. The character has as red is prominent in her costume, and she is the largest most athletic looking of the group, whereas the Red Kite is a medium-large bird of prey found in the UK amongst other places. I thought if I was going to name a Marvel UK character for a bird, it should be one found in these isles. Kite and her sisters were sent after Cable and Badhand by Porlock and Crowe. Their ship was later shot down, forcing Kite and her sisters to alter their forms in order to survive. I believe Kite then transformed into a red skinned form as shown below. I'm judging by the red coloring, her short spiky hair, and their size. This makes Kite the largest Harpy in both forms. Porlock decided to pit Slaughterhouse Six against the Shadow Riders as the first major field test of their powers. At Mys-Tech's London headquarters, the group appeared to be undergoing some sort of training exercise as Porlock showed them to the rest of the board. The group were pitted against Mys-Tech guards. Then Porlock took Slaughterhouse Six to Arena World and asked Rathcoole to send some Warheads to test their abilities as a "warm up" before the arrival of the Shadow Riders. Slaughterhouse Six attacked the Warheads troop almost as soon as they arrived on Arena World. Kite attacked Che, disarming him, while Hatch crept up behind him. Porlock ordered them to stop before they could kill all of them, however. Later, the Shadow Rider's arrived with Cable and Mathew Ryan in tow. Slaughterhouse Six attacked. During the conflict, Porlock triggered a transformation in Mathew Ryan, unleashing his Abadon persona. Abadon stunned Cable and the Shadow Riders with his powers putting an end to the fighting temporarily. The Shadow Riders and Cable gained some respite when their ally Goodfellow appeared and confronted Abadon. Porlock ordered Slaughterhouse Six to attack, but Goodfellow power leeched one of them and transferred their time-phase power to Boot. Boot used this ability to slip himself and his companions between dimensions to safety, and Cable pulled the warhead called Che with them. Porlock ordered Slaughterhouse Six and the remaining Warheads to return to Earth. They returned to the portal station in Annapurna, India, that they had used to reach Arena World. Abilities: She started out as an amoeboid life form. As part of the Harpy gestalt, she can adapt to life threatening situations by re-evolving when under threat of death. This improves their ability to survive under hostile conditions. To this end they can absorb various energies and draw on the programs installed in the protosilicon to access a library of different body shapes and adapt them to their needs. If one particular form proves unsuitable for survival, the Harpies re-form, upgrading their defenses and changing their appearance to suit a new situation. The Harpies can also call upon powerful psychic energies and are incredibly strong (lifting around 1 ton increasing into the Class 10 range after Magna Parton) and fast (again, more so since Magna Parton). Each maintains a strong psychic link with the other, which often means that the pain of one will affect the performance of the rest of the group. In this new form she had clawed hands. Like all of the Harpies in their Slaughterhouse Six forms, she is even harder to kill. Furthermore, she can slip between dimensions to avoid danger. She can fly at extreme speeds (subsonic). Like Kite, this character remained unnamed throughout all her appearances. As with Kite, I went for other bird related names. I chose Nest because of her bushy afro hair, unable to think of any bird names based on her image. Nest and her sisters were sent after Cable and Badhand by Porlock and Crowe. Their ship was later shot down, forcing Nest and her sisters to alter their forms in order to survive. I believe Nest then transformed into an insect like form as shown below. I'm judging by the similar "afro" look to her "hair". Porlock decided to pit Slaughterhouse Six against the Shadow Riders as the first major field test of their powers. At Mys-Tech's London headquarters, the group appeared to be undergoing some sort of training exercise as Porlock showed them to the rest of the board. The group were pitted against Mys-Tech guards. Then Porlock took Slaughterhouse Six to Arena World and asked Rathcoole to send some Warheads to test their abilities as a "warm up" before the arrival of the Shadow Riders. Slaughterhouse Six attacked the Warheads troop almost as soon as they arrived on Arena World. Porlock ordered them to stop before they could kill all of them, however. Later, the Shadow Rider's arrived with Cable and Mathew Ryan in tow. Slaughterhouse Six attacked, and Nest targeted Vorin with her sword. Roadie tried to stop her with a psi snare, but it slid right off her mind. Roadie was more successful in beating her back with her psi blasts. However, Porlock shot Roadie and then triggered a transformation in Mathew Ryan, unleashing his Abadon persona. Abadon stunned Cable and the Shadow Riders with his powers putting an end to the fighting temporarily. The Shadow Riders and Cable gained some respite when their ally Goodfellow appeared and confronted Abadon. Porlock ordered Slaughterhouse Six to attack, but Goodfellow power leeched one of them and transferred their time-phase power to Boot. Boot used this ability to slip himself and his companions between dimensions to safety, and Cable pulled the warhead called Che with them. Porlock ordered Slaughterhouse Six and the remaining Warheads to return to Earth. They returned to the portal station in Annapurna, India, that they had used to reach Arena World. Abilities: She started out as an amoeboid life form. As part of the Harpy gestalt, she can adapt to life threatening situations by re-evolving when under threat of death. This improves their ability to survive under hostile conditions. To this end they can absorb various energies and draw on the programs installed in the protosilicon to access a library of different body shapes and adapt them to their needs. If one particular form proves unsuitable for survival, the Harpies re-form, upgrading their defenses and changing their appearance to suit a new situation. The Harpies can also call upon powerful psychic energies and are incredibly strong and fast (more so since Magna Parton). Each maintains a strong psychic link with the other, which often means that the pain of one will affect the performance of the rest of the group. In this new form she was insect-like. She appears to have compound eyes. She has six arms. Her hands and feet have claws, but she also wields a knife or sword. She has a prehensile tail. Like all of the Harpies in their Slaughterhouse Six forms, she is even harder to kill. Furthermore, she can slip between dimensions to avoid danger. She can fly at extreme speeds (subsonic). 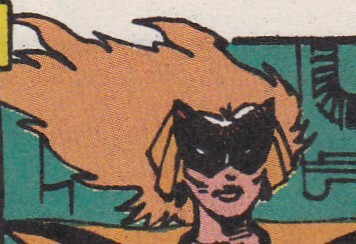 Her speed, and perhaps time phasing, appear to give some resistance to psionic attacks, as Roadie's psi-snare simply slid off her mind while she was moving at super speed, but later the telepath's psi blast hurt her when she was standing still. Rook and her sisters were sent after Cable and Badhand by Porlock and Crowe. When Cable activated his transports cloaking screen, Rook detected it and reported it to Hatch. Hatch told her to activate their own screen and follow discretely, which Rook did. The Harpies monitored relayed Cables activities to Crowe, who then ordered Rook to retrieve the Clavis Key. Rook acknowledged Crowe, but had Firecrest close communications so that she could remind the group of their primary loyalty to Porlock. She then ordered Firecrest to bring Cable and the Key aboard the ship. However, Badhand shot them down. Rook was the only one of the Harpies left undamaged by the crash, and the first to pull herself out of the wreckage. Although she didn't want to, she joined her sisters in changing their forms. I believe Rook then transformed into a form with oversized limbs as shown below. 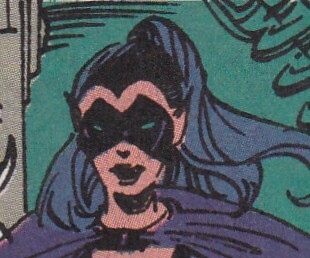 Although she wasn't identified as Rook in Shadow Riders, I'm judging by their similar masks. Porlock decided to pit Slaughterhouse Six against the Shadow Riders as the first major field test of their powers. At Mys-Tech's London headquarters, the group appeared to be undergoing some sort of training exercise as Porlock showed them to the rest of the board. They were pitted against Mys-Tech guards, and Rook slashed one of them with her claws, cutting his weapon into several pieces. 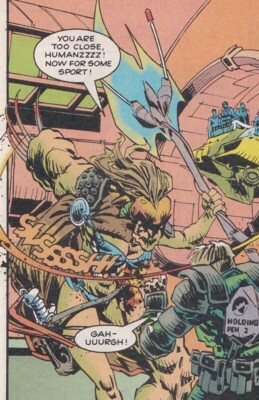 Porlock took Slaughterhouse Six to Arena World and asked Rathcoole to send some Warheads to test their abilities as a "warm up" before the arrival of the Shadow Riders. Slaughterhouse Six attacked the Warheads troop almost as soon as they arrived on Arena World. Rook was the first to strike, slashing a Warhead in half. Porlock ordered them to stop before they could kill all of them, however. Later, the Shadow Rider's arrived with Cable and Mathew Ryan in tow. Slaughterhouse Six attacked, and Rook badly wounded Grunt with her claws. However, she too was hurt when Stranger attacked in his phased state. During the conflict, Porlock triggered a transformation in Mathew Ryan, unleashing his Abadon persona. Abadon stunned Cable and the Shadow Riders with his powers putting an end to the fighting temporarily. The Shadow Riders and Cable gained some respite when their ally Goodfellow appeared and confronted Abadon. Porlock ordered Slaughterhouse Six to attack, but Goodfellow power leeched Rook and transferred her time-phase power to Boot. Boot used this ability to slip himself and his companions between dimensions to safety, and Cable pulled the warhead called Che with them. Porlock ordered Slaughterhouse Six and the remaining Warheads to return to Earth. They returned to the portal station in Annapurna, India, that they had used to reach Arena World. 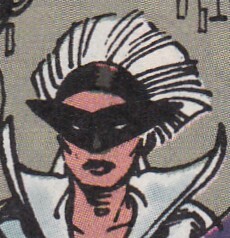 Abilities: In her humanoid form, Rook wore metallic gloves with claws. She may have had natural claws underneath the gloves. She could pilot the Harpies craft. She started out as an amoeboid life form. As part of the Harpy gestalt, she can adapt to life threatening situations by re-evolving when under threat of death. This improves their ability to survive under hostile conditions. To this end they can absorb various energies and draw on the programs installed in the protosilicon to access a library of different body shapes and adapt them to their needs. If one particular form proves unsuitable for survival, the Harpies re-form, upgrading their defenses and changing their appearance to suit a new situation. The Harpies can also call upon powerful psychic energies and are incredibly strong (lifting around 800lbs increasing to 1 ton after Magna Parton) and fast (more so since Magna Parton). Each maintains a strong psychic link with the other, which often means that the pain of one will affect the performance of the rest of the group. In this new form her right arm and left leg were oversized. She had large claws on her right hand, and some smaller ones on the left foot. She could penetrate even the supra dense skin of Grunt with these claws. Like all of the Harpies in their Slaughterhouse Six forms, she is even harder to kill. Furthermore, she can slip between dimensions to avoid danger. She can fly at extreme speeds (subsonic). The Harpies were sent after Cable and Badhand by Porlock and Crowe, and boarded their craft. They chased Cable to the Parton Magna stone circle, where it was shot down by Badhand. 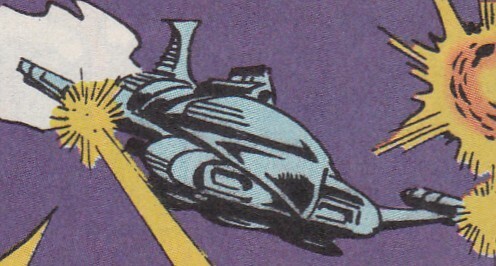 The Harpies craft could fly at subsonic speeds (250 - 500 mph), traveling from Mys-Tech HQ in London to the stone circle in Sussex in a short amount of time. It had superior sensors and cloaking screens than Cable's craft, able to detect it and follow unnoticed. 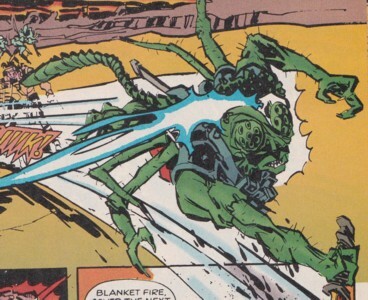 It had tractor technology and a stasis ray which could be used to levitate and/or paralyze their targets. The stasis ray was capable of completely immobilizing Cable, but Badhand was able to resist it with great effort using his cybernetic arm.